So, you’re new to skincare. Or you want to make some changes to your routine. Or maybe you want to try out the Korean skincare routine. We know — there are so many products out there and so many steps in the Korean routine that it can all feel very intimidating. Where should you start? What kinds of products should you start with? Do you need to be double cleansing? Should you start with all ten steps? How should you get started? It’s okay! We’re here to help. When we talk about skin type, we’re typically referring to four basic skin types: dry, combination, normal, and oily. We like to recommend you start by identifying your skin type because skin type is the general category that will point you in a general direction of the types of products you should be looking for. There are different ways you can go about figuring out your skin type, but, for our purposes, we recommend the clean face method because it’s simple: cleanse your face, dry it, and don’t apply any products. Just let your skin sit. After thirty minutes, look at your skin, then check it again thirty minutes later. Does your face look shiny all over? Does it feel kind of slick to the touch? If you applied blotting paper to your face, would it come away saturated with oil, no matter where you applied the paper? If so, you likely have oily skin. Is part of your face (i.e. your T-zone) shiny while other parts (i.e. your cheeks) feel tight and parched? Or is part of your face shiny while other parts feel just fine? Or, alternately, do some areas on your face just feel fine while other parts feel tight and patchy? You likely have combination skin, which put simply means that parts of your face are one skin type while other parts are, well, a different skin type. People commonly think that combination skin is a combination of dry and oily, but combination skin can be a mix of any of the skin types, oily/normal, dry/normal, etcetera. Does your skin feel tight and parched all over? Is it starting to show ashy patches? Does it feel flaky, maybe even itchy? You likely have dry skin. And, finally, does your skin feel just fine, balanced and hydrated? Lucky you — you likely have normal skin. Just because you break out doesn’t mean you have oily skin. Oily skin types may be more prone to regular, more intense breakouts, but breakouts alone are not an indication of skin type. Skin concerns like sensitivity or redness are not the same as skin types; they’re concerns that can affect any skin type. Your skin type can change! Skin types are dependent on a whole variety of factors, from genetics to hormones to climate, amongst others, so your skin type can change depending on your stress levels or, even, depending on the season. Start with the basics; don’t just jump into the 10-step routine. 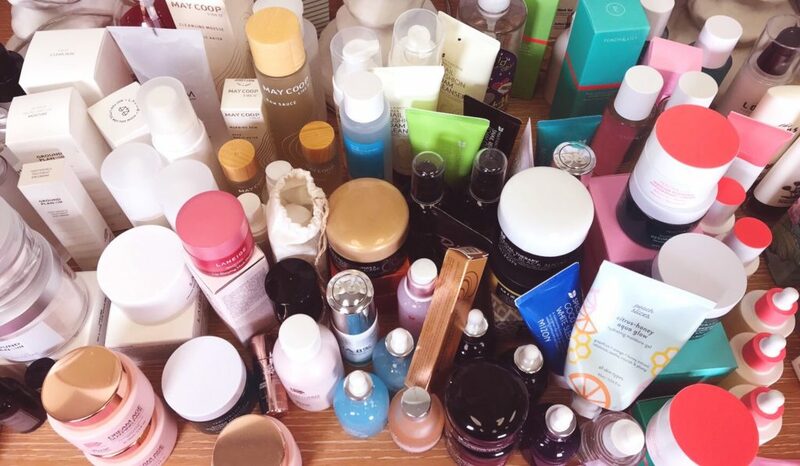 We like the Korean 10-step routine (obviously), but we admit that it’s a lot to jump into right away — it might not even be the most beneficial for you to inundate your skin with so many products at once all of a sudden. When you’re just starting to figure out your routine, we recommend starting with the very basics — a cleanser, a toner, and a moisturizer — and maybe adding a general good-for-skin-health serum (like the Peach & Lily Glass Skin Refining Serum) if you want. Give your skin time to respond to your selected products, and listen to your skin. Just because a certain product is recommended for your skin type doesn’t mean that it’ll be the right product for your skin; it could still be too heavy or too drying or too greasy. Your skin is its own unique organ, and, unfortunately, there’s no way around the trial-and-error process that is developing your own skincare routine. So have fun with it! Ask for samples, and read return policies! And, as you get more comfortable with products and start to identify specific skin concerns, gradually add other products into your routine. Remember to give your skin time to show results — generally, it will take about 3-4 weeks for a product to start working. At the same time, if your skin shows signs of irritation/redness or starts to feel sensitized, stop using that product immediately and go back to the basics, and give your skin time to calm down and your natural skin barrier to be revitalized before trying new products again. Normal skin can take a wider range of textures and products than other skin types, but you should still be gentle with normal skin, avoiding harsh products and opting for products that hydrate, nourish, and balance skin. Start with the double cleansing technique — using an oil-based cleanser first and following that with a water-based cleanser — to get a thorough but gentle cleanse that won’t strip your skin dry. Follow that with a toner that will help balance the pH level in your skin, and hydrate and seal everything in with a moisturizer. Normal skin types don’t necessarily need very thick textures. Dry skin requires lots and lots of hydration, so you want to be thinking about hydrating with every single step, even when it comes to cleansing. Look for super gentle cleansers that will give you that deep cleanse without over-cleansing or stripping your skin dry, whether they’re oil-based or water-based! Some oil-based cleansers can be too strong, removing all oil from skin, even the good oils that balance skin and keep it healthy. Dry skin types might want to opt for a toner/essence that will help balance skin’s pH level while also drenching skin with hydration — you might want to try a waterless toner/essence that is all about hydration. You should also opt for a thicker moisturizer to help seal moisture in and deliver emollients to help fill in the gaps in those dry, flaky patches, so your dry skin can get the relief of deep hydration and conditioning it so desires. Combination skin can be particular and difficult to figure out. We recommend taking things gently, cleansing thoroughly with products that won’t strip your skin dry, and applying products in layers. Combination skin types might benefit more from textures that are more gel-like or pudding-like, instead of heavy, thick creams, though, if you one of your skin types is dry, you may want to layer on something heavier on those dry patches. Oily skin can benefit a lot from the double cleansing technique, which might sound counterintuitive because adding oil to already oily skin? Won’t that make oily skin even worse? Oil-based cleansers help sweep away excess oil, though, while also dissolving stubborn makeup, sunscreen, and other oil-based impurities. They go deep into pores and remove debris, oil, and other gunk, and, by doing so, oil-based cleansers can actually help balance sebum production and help prevent breakouts by clearing away excess sebum and bacteria-laden congestion that can lead to acne, blackheads, and other irritations. Make sure to follow up your oil-based cleanser with a water-based cleanser to remove sweat, dirt, and any remaining residue. A toner helps balance the pH in skin, and we recommend looking for a toner that also has light exfoliating properties to help remove dead skin cells on the surface of skin. Oily skin types should never forget to moisturizer as well, though you should generally avoid thick creams — we recommend lighter textures that will absorb quickly while sealing moisture into skin. It’s important to remember that oily skin can get dehydrated, too, so it’s crucial to make sure your skin is getting sufficiently hydrated. When skin becomes dehydrated, it often responds by amping up sebum production, which leads to even oilier skin. If you’re still feeling overwhelmed, reach out to experts! There’s nothing wrong about asking for help! If you’re not sure where to start, take advantage of Peach & Lily’s complimentary Ask Lily program! Email your skin questions and concerns to [email protected], and one of our in-house estheticians will get back to you with answers and product suggestions to set you up on your personalized routine!